Beijing’s ‘dual track approach’ confounds more than it clarifies. While the approach itself could be dismissed as old wine in new bottles by close observers, it nonetheless deserves critical examination because it may be quite deceiving to the untrained eye. The dual track, in Beijing’s eyes, envisages: 1) the handling of bilateral disputes by the countries directly concerned through negotiations; 2) the maintenance of peace and stability in the South China Sea through joint efforts of China and the ten members of the Association of Southeast Asian Nations (ASEAN). Some Chinese policymakers and academics have also been arguing that the approach is not just unilaterally initiated by China but an agreement of some sort reached between China and ASEAN countries directly concerned about the South China Sea, or that the concept at least enjoys wide recognition and support in Southeast Asia. Before examining that claim, let us first focus on what the approach advocates and why it makes sense for China. A “dual track approach” works to China’s advantage because it seeks to divide both ASEAN and other potential forces that could counter Beijing’s behavior as well as the very aspects of the South China Sea issue as well. The trouble, as we shall see, is that these two tracks are in fact arguably inseparable in practice. That is, how China resolves its claims with other claimant states affects regional peace and stability, while the extent to which some ASEAN states are willing to go along with Beijing’s regional initiatives is partly dependent on how it resolves its claims, since it says something broader about China’s rise. The dual track approach facilitates China’s preference for a divided ASEAN on the South China Sea issue. Note that ASEAN only appears in the second track – “the maintenance of peace and stability in the South China Sea” – but has no role when it comes to the “handling of bilateral disputes,” which is restricted only to the four ASEAN claimant states. Here, China is essentially repeating its long-held view that disputes should be resolved bilaterally between it and claimant states – Brunei, Malaysia, the Philippines and Vietnam – rather than with ASEAN as a whole or the interference of other external parties. This works to its advantage because it is easier for Beijing to take on individual ASEAN countries than the organization collectively or even a sub-group of countries, particularly given the vast asymmetries in capabilities in China’s favor. In addition, by advocating two separate tracks on maintaining peace and stability in the South China Sea and the handling of bilateral disputes, China is able to divide aspects of the issue as well. Beijing’s “incremental assertiveness” in the South China Sea, including the seizure of individual features and massive land reclamation activities, can be seen as efforts to enforce its “nine-dash line” claim relative to other claimants, which is no business of ASEAN’s. Meanwhile, the collective will of ASEAN as a grouping – to the extent that is exists – is drawn upon not to confront Beijing’s assertiveness, but only in “maintaining peace and stability,” chiefly through the promotion of ASEAN-China maritime cooperation. As I have recently written, this cooperation can take various forms, from economic and people-to-people measures like setting up an ASEAN-China Ocean College to limited confidence-building initiatives such as establishing hotlines. At first glance, the dual-track approach might seem to make sense. 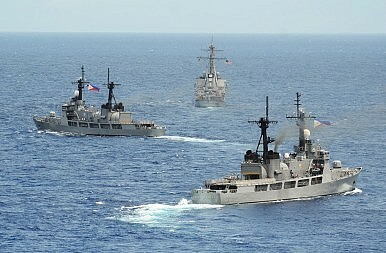 Few would disagree with the conceptual distinction between actual disputes in the South China Sea, which only affect claimant states, and regional peace and stability which impacts all surrounding countries, including ASEAN countries. The trouble is that this conceptual distinction embodied in China’s dual-track approach does not really work quite so neatly in practice. Simply put, how China handles its disputes with claimants affects regional peace and stability, while the extent to which some ASEAN states are willing to go along with Beijing’s regional initiatives is partly dependent on how it resolves its claims since it says something broader about China’s rise. On the first point, as noted earlier, Beijing might view its “incremental assertiveness” in the South China Sea, including the seizure of individual features and massive land reclamation activities, as efforts to enforce its ‘nine-dash line’ claim relative to other claimants, which is no business of ASEAN’s (in line with the first track). Yet ASEAN countries have viewed these developments involving various claims as warranting their involvement because how they are resolved affects peace and stability, which suggests that the South China Sea issue really transcends any simplistic division of two tracks. While it is difficult to account for the diversity of positions within the group, ASEAN’s Six-Point Principles on the South China Sea adopted in 2012, which I examined here, states clearly in three of the last six points that the grouping does care about how various claimants settle disputes among themselves, even if it does not take a position on who should own what. Basically, all parties (including China) ought to fully respect universally recognized principles of international law (including the United Nations Convention on the Law of the Sea or UNCLOS), exercise self-restraint and non-use of force, and resolve disputes peacefully. Therefore, contrary to Beijing’s claims about agreement on its dual-track approach, it would seem that ASEAN has actually said in a limited sense that it indeed does have an interest in the “handling of bilateral disputes.” The division between these two tracks is thus far from clear. On the second point, another reason why the two track division might not work well in practice is that some ASEAN states’ willingness to go along with Chinese regional initiatives might be limited by the assertiveness with which China is resolving its claims with other claimants. This point is a harder one to make, both because it is more difficult to publicly point to something that did not happen and because the outcomes are more dependent on the country and type of initiative in question. But as I have said elsewhere, there is a reason why grander Chinese regional initiatives designed to promote wider peace and stability — such as a Treaty of Good Neighborliness, Friendship and Cooperation — have been met with some skepticism even if ASEAN countries continue to embrace other specific projects under the ASEAN-China Maritime Cooperation Fund related to maritime connectivity, research and science and technology. There still remains a certain trust deficit, and Beijing’s assertiveness in the South China Sea has not helped. Of course, as I noted in an earlier piece, there are divisions within ASEAN. Some countries, like Cambodia, may be more willing to accede to a strict dual track approach, while others may be happy to ink general statements with platitudes about respecting regional norms and international law while pragmatically signing on to China’s economic initiatives anyway. I’ve argued previously that this might indeed be what Beijing is seeking: a divided ASEAN that comes increasingly under its economic control while China builds up its military capabilities to ultimately get its way in the longer run. But just as ASEAN states clearly see Beijing’s less than benign intentions and rising capabilities, they can also likely see past the simplicity of a dual-track approach that is divorced from the ground realities that China is working so hard to drastically change in the South China Sea.